Our house was built in Matthews Park. Don't look for it on any current maps of Brooklyn. Beverly Square West, the neighborhood where we live, was originally known as Matthews Park from at least 1900, the same year our house was built, to 1902. Two articles from the Brooklyn Eagle document the boundaries of Matthews Park, which exactly coincide with those of what is today called Beverly Square West. Mr. Bolles is one of a committee of three of the Matthews Park Association, appointed to visit the Police Board to find out why there are so few policeman in that section. Matthews Park extends from Beverley road to Avenue C, and from Coney Island avenue to Fifteenth street. A March 5, 1902 article, Sign Posts for Matthews Park, describes the submission of "a design for cast iron sign posts to be placed on all corners of Beverley and Cortelyou Roads, from East Eleventh to East Fifteenth Streets, inclusive." The same article also mentions that "it is intended to adopt on these blocks the same names at present in vogue for the same streets in Prospect Park South," which is today a landmarked Historic District just up the block from us. So the numbered streets - East 11th through 15th Streets - became named Streets: Stratford, Westminster, Argyle, Rugby and Marlborough. Tony sounding, eh? Or, if you prefer, the acronym SWARM. A rare opportunity to visit sites and buildings closed to the public the rest of the year. openhousenewyork hosts year-round educational programs celebrating New York City’s built-environment, culminating in America’s largest architecture and design event, the Annual openhousenewyork Weekend. Governor's Island, NY Harbor, Manhattan: Guided tours describe the history and future of the 92-acre island's National Historic Landmark District in the hear of New York Harbor. View military installations from the American Revolution and hear about plans for the island's redevelopment. Organized by the Governors Island Preservaton & Education Corporation. High Line Cell Phone Tour, Meatpacking District, Manhattan: Self-guided cell phone tour discusses various stopping points along the High Line, the disused freight rail currenlty undergoing conversion into NYC's first elevated park. Dial the main phone number 888-7-LOOK-UP starting Saturday, Oct 7th. Each stop has it's own three-digit extension. Organized by the Friends of the High Line. Victorian Flatbush Walking Tour, Flatbush, Brooklyn (yep, it's my neck of the woods! ): Follow Brooklyn Borough Historian Ron Schweiger through one of the largest concentrations of Victorian Queen Anne, Colonial Revival and Greek Revival homes in the US. 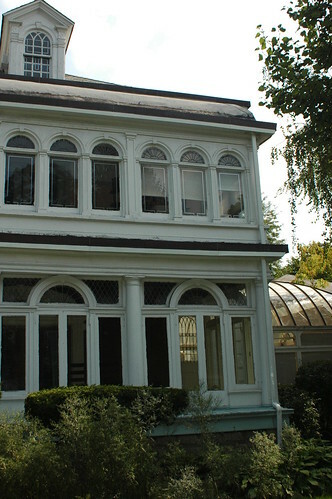 View journalist Nellie Bly's former home, a 1903 japanese "cottage" and many more! Organized by OHNY. World Trade Center -- The Greening of Ground Zero, Lower Manhattan: This walking tour will discuss both the scope of the World Trade Center project, Visit the recently completed 7 WTC,and learn about current work at the site, the PATH station's sustainable features, the memorial and other WTC buildings. Organized by GreenHomeNYC. The mission of Food For Thought, a volunteer-driven grass roots organization, is to provide nutritional support to people living with AIDS/disabling HIV disease. They supply groceries to over 300 men, women and children each month. Several years ago, my job at that time was ending, and I was uncertain if I would continue in the same career. I considered going back to school and getting a degree in horticultural therapy. The gardens of Food for Thought sound like the vision I had of what could be accomplished. It brings together non-profit organizing, community involvement and relevance, and deeply and personally meaningful volunteer opportunities. Gardening provides the means to accomplish all of these, and thus becomes an end in itself. Founded in 1999 to provide produce for people living with AIDS, the garden is part of what may well be the country’s hippest food bank, a place where the Alice Waters grow-your-own organic food ethic supplants gloomy institutional staples like American cheese and day-old bread. The garden, run by Food for Thought, a nonprofit organization, is overseen by horticulturalists from the nearby Occidental Arts and Ecology Center, and many of its volunteers are H.I.V. patients who benefit from it. It brims with green beans and scallions but also obscure varieties of amaranth, an ancient Andean grain with flowing Rapunzel-like purple stalks. The fresh produce harvested by the volunteers is the food bank’s mainstay, though it also dispenses other groceries as well as vitamins. The bank reflects not only Sonoma County’s obsession with food and wine but also its lesser-known side: long a weekend and vacation destination for gays from San Francisco, about 70 miles south, the area along the Russian River absorbed a heavy exodus from the city in the 1980’s, during the height of the AIDS epidemic. The food bank, which has an exuberant bower of pink Mme. Alfred Carrière roses at the entrance, serves as horticultural therapy for the volunteers, who prune, snip and add wiggly red worms to vegetable compost. It is also part of a broader move to bring organic food and a bit of the wild into places where it has been lacking, among them schools and prisons. Although our lives depend on plants for virtually everything that keeps us alive (oxygen, food, fibers, lumber, fuel, etc), their lives remain a secret to most of us. The reason is simple - plants live on a different time-scale from ours. Although not usually obvious in the relatively hyperactive activities of humans, plants are in constant motion as they develop, search for light and nutrients, avoid predators, exploit neighbors, and reproduce. Time-lapse photography allows us to easily see the movements of plants and clearly demonstrates that plants are living organisms capable of some extraordinary things. ... The movies on this site show a variety of plants living out their dynamic lives. While we especially hope this site provides material that may captivate the interest of budding plant biologists, even the seasoned plant biologists will find interesting material. Not to mention jaded old gardeners! Viewing the movies requires QuickTime. Thanks to Seed Magazine's Daily ZeitGeist for bringing this to my attention. National Public Lands Day is the nation’s largest hands-on volunteer effort to improve and enhance the public lands American’s enjoy. In 2005, nearly 90,000 volunteers built trails and bridges, planted trees and plants, and removed trash and invasive plants. Join us Saturday, September 30, 2006 for the 13th annual National Public Lands Day and help us care for our land. We invite everybody from federal land management agencies to state parks and playgrounds in local neighborhoods to participate. Check their Get Involved page to learn more. Activities in your area may be coordinated by a local organization. For example, in New York City the activities are being coordinated by Partnership for Parks, a joint program of the NYC Department of Parks and Recreation and the private, non-profit CityParks Foundation. Thanks to RESTORE, the weekly email newsletter of the Society for Ecological Restoration International (SER), for bringing this to my attention. Take a good look at the WWF website, (World Wildlife Fund, not the other one) and what do you see? The giant panda, of course. Tigers. Gorillas. Cetaceans. The token reptile, a sea turtle. Generally cute and/or fuzzy, or, failing that, sleek and "handsome". Notice a pattern? Pulling up the Ohio Endangered Wildlife List, I discovered that among the listings was a species of midge. A midge! You know, the relatively inconspicuous insects that go largely unnoticed by anyone except entomologists--unless you're swatting at a cloud of them. If that wasn't enough, they were joined by endangered lampreys, beetles, clams, and some of the aforementioned snakes. Well, that settled it. These were as imperiled, and at least as important as the black bear, whose stories have peppered state news. Where were the American burying beetle news features? The "Save the Wartyback Mussel" t-shirts? The Ohio lamprey plush toys? Thamnophis radix radix, the eastern plains garter snake. Now, I happen to be quite fond of the squamates, but I recognize that others are not, so there's a need to highlight their perils and needs for protection and conservation. The Indiana Bat is another species on the Ohio list which is largely misunderstood, if not outright feared, and therefore deserving of special attention. I think Garfman can go "uglier." Hagfish is about as gross as you can get, but they're not on the Ohio list. Lampreys are a close second, and they're on the list. What would be your top choice for an endangered "ugly" species? Thanks to Matt's Pooflingers for bringing this to my attention. The experimental area, showing the five cleared patches, with two connected by a corridor. Habitat fragmentation is one of the largest threats to biodiversity. Landscape corridors, which are hypothesized to reduce the negative consequences of fragmentation, have become common features of ecological management plans worldwide. Despite their popularity, there is little evidence documenting the effectiveness of corridors in preserving biodiversity at large scales. Using a large-scale replicated experiment, we showed that habitat patches connected by corridors retain more native plant species than do isolated patches, that this difference increases over time, and that corridors do not promote invasion by exotic species. Our results support the use of corridors in biodiversity conservation. To perform the research, the scientists collaborated with the U.S. Forest Service at the Savannah River Site National Environmental Research Park, a federally protected area on the South Carolina-Georgia border. Most of the Savannah River Site is covered with pine plantations. The U.S. Forest Service created eight identical sites, each with five openings, or patches, by clearing the pine forest. A central patch was connected to one other patch by a 150-meter-long, 25-meter-wide corridor, while three other patches were isolated from the central patch – and each other – by the surrounding forest. The patches are home to many species of plants and animals that prefer open habitats, many [of] which are native to the historical longleaf pine savannas of this region. The researchers surveyed all plant species inside connected and unconnected patches from 2000 to 2005; nearly 300 species of plants were found. When the study began, there was no difference in the number of species between connected and unconnected patches, the scientists say. After five years, however, patches with a corridor retained high numbers of species, while those without a corridor lost species. Corridors provided the largest benefit to native species while having no effect on the number of invasive plant species. Invasive species seem to already be everywhere, not needing corridors for their spread, or remain where they originated, [lead author, Ellen] Damschen says. These results indicate that using corridors in conservation should provide benefits to native species that outweigh the risk of furthering the spread of exotic species. I see two problems with generalizing the favorable results from this study. First, the study looked at clearings in forests. As the press release notes, the species are those which prefer open regions. These are more likely to be "opportunistic" species adapted to colonizing disturbed areas such as those arising from fires. I would expect such species to "travel" well, since they must locate these open areas before they regain significant woody plant cover. The second problem I see with generalizing these results is that it's looking at the wrong kind of corridor. The single greatest threat to biodiversity is habitat loss arising from human activities, such as development, logging, mining, farming, and so on. These activities create the inverse relationship: "patches" of forest or other undisturbed habitat separated, divided, and chopped up by human activities, ie: clearings. The corridors we need, and which ecologists and others strive to implement and preserve, connect forests and other habitats separated by clearings, not clearings separated by forest. Silvercup Studios is most famously home to Tony Soprano; since last July the former bakery, located next to the Queensboro Bridge, also became the site of New York’s largest green roof. In 2002 landscape architect Diana Balmori conducted a study of the city’s rooftops to identify the best area where green-roof construction could have an impact not just on an individual building but an entire neighborhood. The study revealed that Long Island City would be the most promising neighborhood for clustering these environmentally friendly roofs, which help clean the air, reduce storm-water runoff, lower energy consumption, and ultimately reduce the heat caused by urban congestion. There is enough suitable flat roof space in Long Island City to cover more than 26 million square feet with green-roof technology—or 667 acres, nearly the size of Central Park. Known as pancake roofs, the countless flat-topped warehouses were mostly built before 1955, when structures were generally overengineered; therefore they can withstand rooftop vegetation without additional support. The green-roof system on Silvercup is a modular one built by GreenTech, a company based in Roswell, Georgia, which donated a third of the modules for the project. Unlike plantings directly on the roof—a more common type of green-roof system—the interlocking modules can be moved and replaced (see “Green How-To” on page 100). Covering 35,000 square feet required 1,500 modules filled with a lightweight soil and then planted with 20 different varieties of sedum. Sedum is heat and drought resistant because it retains a high percentage of water in its shallow root system. Therefore it absorbs and holds more rainwater, reducing storm-water runoff and minimizing landscaping maintenance. Irrigation is needed to get the plants established, but they eventually become self-sustaining. Locations of day and night on the earth at approximately 13:20 EDT, 17:20 UTC, less than nine hours before the 2006 autumnal equinox. Credit: Official US Time, NIST and USNO. The Autumnal Equinox (is it the Vernal Equinox for those of you in the southern hemisphere?) occurs at 4:03 on September 22, 2006. But ... the equinox occurs when the sun "crosses" the equator (for you geocentrists), or the equator passes "beneath" the sun (for you heliocentrists), or something. It's the same moment in time for everyone on the planet, even if the sun's not visible to them. It can't be "4:03" for everyone. So what time is 4:03 anyway? Times of equinoxes are given in Universal Time, abbreviated as UT or UTC (more politically correct than Greenwich Mean Time, and close enough for most of us). To know when the equinox occurs for you, you need to convert from UTC to your local time. I'm still on Eastern Daylight Savings Time, or EDT, which is four hours behind UTC. So the equinox occurs for me just after midnight tonight, the time I've given this post. When we "fall back" the clocks, I'll be back on Eastern Standard Time, EDT, which is five hours behind UTC. Monk parrots are now established in 14 states and spreading north in New York. In their native ranges, they are sometimes serious agricultural pests of fruit crops. We will see what economic damage they cause here as their numbers expand. We don’t know how much environmental damage they’ve already caused by competing with and displacing native species. As the ornithologist Joseph M. Forshaw noted admiringly, “Parrots are such wonderful generalists.” This is a common trait of invasive species, including other generalists that New Yorkers are all too familiar with: starlings, pigeons, rats and roaches. Our admiration of these birds should not blind us to their potential impact. I'll be coming back and updating this entry with the back-story about why I wrote the letter, and what I learned about writing letters! The article, published in last Tuesday's New York Times, was an interview with ornithologist Joseph M. Forshaw. Forshaw spoke about his experiences with parrots and humans' relationships with them all over the world, and the dangers they face from exploitation and habitat destruction. I recently had the pleasure of meeting an amazing Australian naturalist ... His name is Dr. Joseph Forshaw and he's widely regarded as the world's foremost authority on parrots. I had the honor of serving as his "guide" when he came to see the wild parrots of Brooklyn. ... The New York Times wrote up a nice story on Dr. Forshaw ... I am glad to say that there are some great shots of the "Brooklyn Boids!" The problem was, the photos accompanying the article in this way associated an introduced species with the important issue of conserving parrots in the wild in their native habitats. The Times identified the parrots as "feral monk parrots." A caption to one of the photos identified them as "nonnative New Yorkers," but provided no further explanation. "Feral" is incorrect to describe these populations. Neither the species nor the individuals are domestic parrots "escaped" into the wild: they are breeding and reproducing in the wild. So I wrote the letter hoping to address, and correct, a misleading absence of information about their status here. My other posts on Parrots and Invasive species. I volunteered this past week at our neighborhood association meeting to photograph houses at risk due to inappropriate zoning in our area. So today I walked around my neck of the woods in Victorian Flatbush in Brooklyn with my camera and two lenses: my standard lens, a 28-85mm zoom, and my wide angle 20mm lens. Of course, I took some photos for my own enjoyment as well, especially because I got to walk through the landmark district of Prospect Park South. I thought I'd share this house in particular with my gardening buddies out there. How do you like this two-story conservatory? 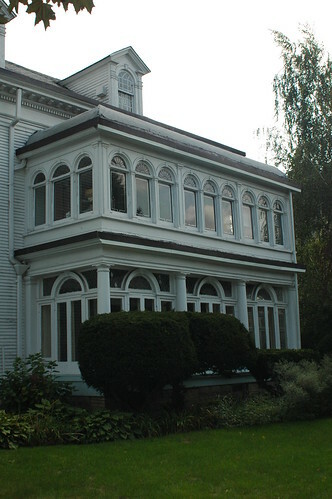 It's hard to see unless you look at the full size picture, but those are leaded glass sunburst fanlight windows above the regular windows on the second story, and the same with diamond-pane leaded glass windows above on the first floor. If that's not enough, you could always expand into the attached greenhouse in the back of the house. 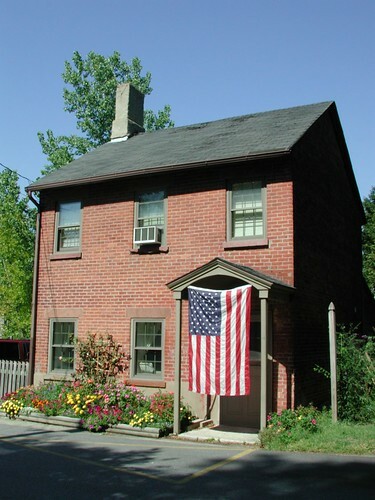 Here's a view of the facade of the house. You can see the conservatory on the right side. 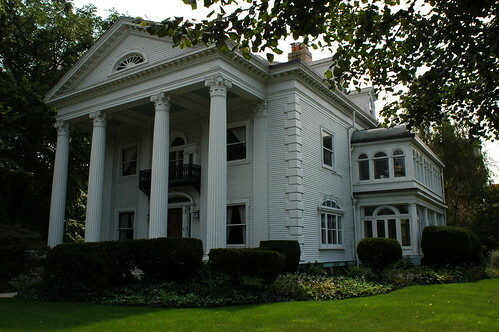 I think we can devise more creative plantings than clipped yews to complement the two-story fluted corinthian columns gracing the front of the house. What do you think, readers? Does this look like an opportunity? A diamond in the rough? Or is it a gigantic, multi-thousand square foot, white elephant? Grief & Gardening #2: Five Years After, "Ths Transetorey Life"
This is a flower border at one of my favorite gardens to visit. Earlier in the year, there has been a succession of Iris, Hemerocallis (Daylilies), Hosta, and other common and sturdy garden perennials. There are ferns, and flowering cherry trees on the grounds. 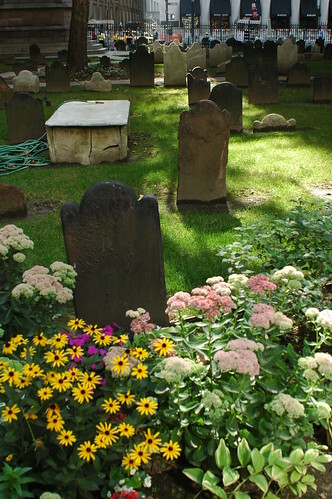 The garden is the cemetery at Trinity Church in downtown Manhattan, just down the block from Ground Zero. The photo above is looking south, toward the church itself. Here's another view looking east, toward Broadway, which is just on the other side of the wrought iron fence surrounding the cemetery. This really is one of my favorite gardens to visit. First off, I love cemeteries. 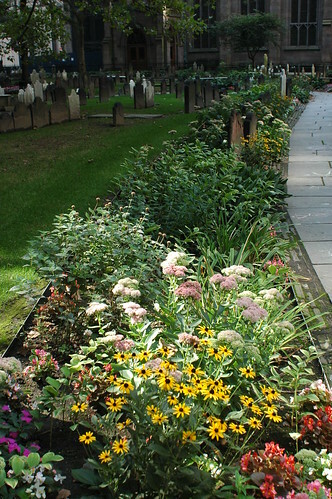 During my troubled adolescence, a cemetery at the end of our street was a refuge for me, a place I could go where no one would bother me, a place of solitude, and quiet. I came to enjoy the history of it, reading the stones to learn about people's lives, how young they died, how many of them were children, and infants. This garden cemetery also reminds me of impermanence. 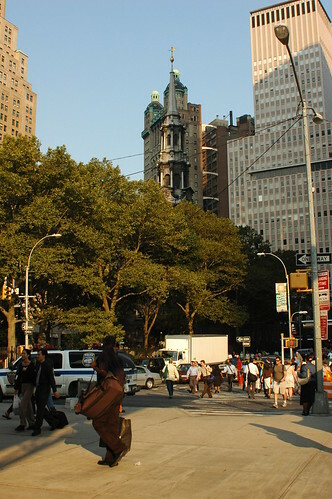 When I walk through it, I'm on my way to work, in the financial district of downtown Manhattan. It's easy to get stressed about work. This walk helps me keep a healthier perspective on things. 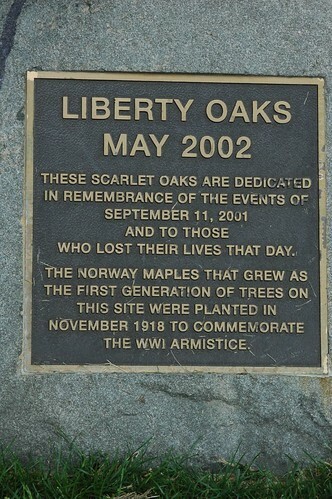 Check out the engraving on this headstone. 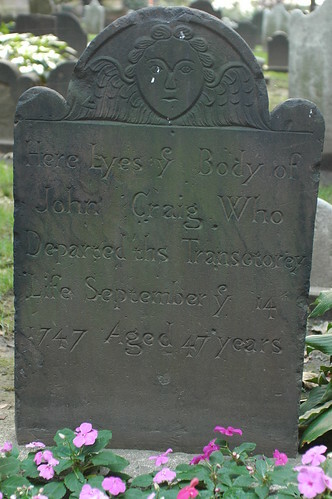 "Here Lyes ye Body of John Craig Who Departed ths Transetorey Life September ye 14 1747 Aged 47 years" At 47 years, he was an old man when he died. He could have easily been a grandfather. And yet, "ths Transetorey Life" ... Next week is the 259th anniversary of his death. How many lifetimes, how many generations, is 259 years? Another thing I enjoy about visiting this garden cemetery is the ritual I've developed for entering it. There's really only one way: from the Rector Street station on the R/W subway line. This lets me out on Church Street. 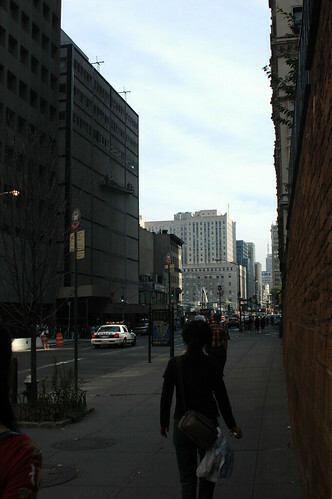 After emerging from the subway, the streetscape is the photo below. This is Church Street, looking north. Ground Zero (of which more below) is just one block away, where the buildings end on the left-hand side. On the right-hand side is a massive, and seemingly ancient, sandstone block wall. See the trees peeking out over the top of it? Those are from the garden cemetery. Here's a view of the church from this vantage. That's right: the cemetery is two stories above your head. Behind those stone blocks are the dead. 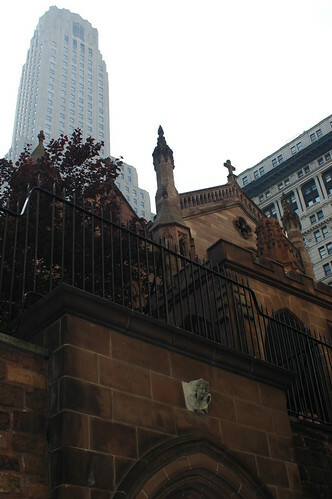 To reach the cemetery, we have to climb still further, through the street-level opening in the wall, of which we only see the top of its gothic arch in the photo above, and up another two flights of stairs. 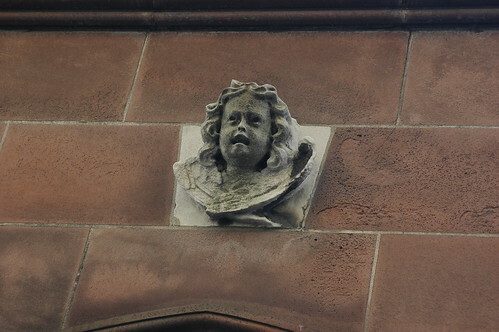 Lest one forget, the sculpture set in the stone above the passageway is no cherub. I wrote earlier this week about the arbitrariness of anniversaries. 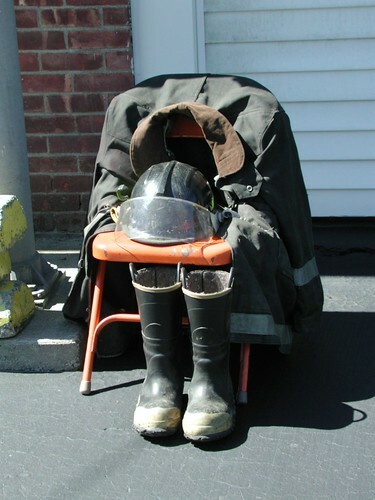 But I have been feeling this one, the 5th anniversary of 9/11. The city is feeling it, too. Peoples' grief is closer to the surface, more accessible. Mine certainly is. I've also been remembering a lot of what it was like in the city right after. There are reminders of it everywhere, on the news, in the papers, special exhibits and events, and especially, at Ground Zero. A Tribute Center was dedicated this week on Liberty Street, on the south side of Ground Zero. I'd heard about it and I went there after work on Thursday. The doors had signs on them which said "Closed." There was a couple next to me also looking at the signs. Someone inside saw them and opened the door for them. I thought they were just closing for the day, and let us in anyway. I tailgated in. I didn't realize that it's not open to the public until September 18. Anyway, it's quite a collection. They have artifacts. It took me a while to figure out what this object was. When I did, it just shocked me. I didn't have my camera with me, just my camera-phone/phonecam. It's a lousy picture, and I'll go back and get a better one. Another thing which shook me was some photographs in one of the display cases. There was a contact print of a couple of frames from a still camera, with some clear problems with light leakage along the top of the frame. The text explained that these photographs were taken by a photographer on the scene. 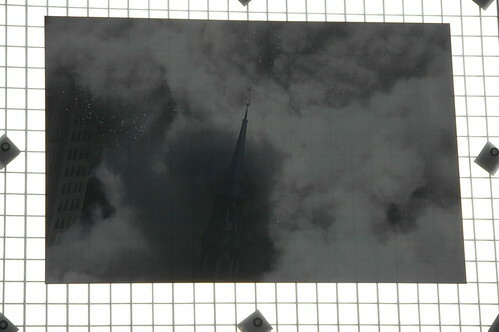 His camera was damaged, and he was killed, when the first tower fell. His camera and film were recovered, and those prints were made. 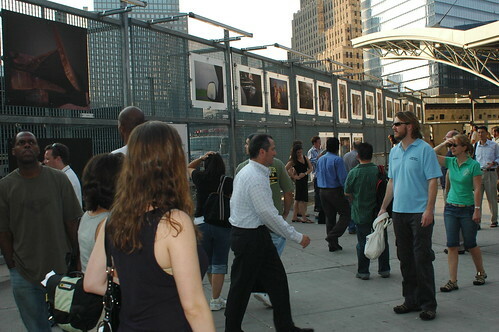 Outside the PATH (Light rail/Subway to New Jersey) station, on the fence surrounding the site, is an exhibit of photographs from September 11 and the recovery efforts. The photographs are incredible, from all different photographers. The names of the photographers and explanations of each scene are displayed alongside the photos. I didn't make notes of their names. I'm hoping I can find a catalog of them online somewhere. Here's one of the photographs. This shows the tower of St. Paul's Church about to be engulfed by the debris cloud from the collapse of the first tower. 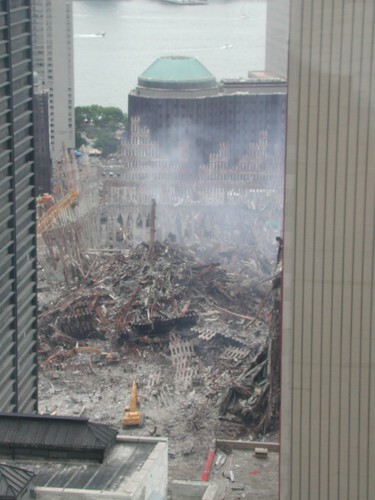 I'm pretty sure this was taken from an office building to the east, looking west toward the church and the World Trade Center site. St. Paul's is directly across the street from the PATH station, and just a couple of blocks up the street from Trinity Church. 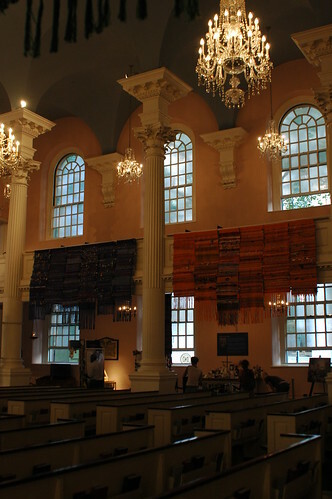 St. Paul's sustained heavy damage, but it survived, and it served as one of the centers for recovery efforts downtown. Its fence was covered with memorials for months. 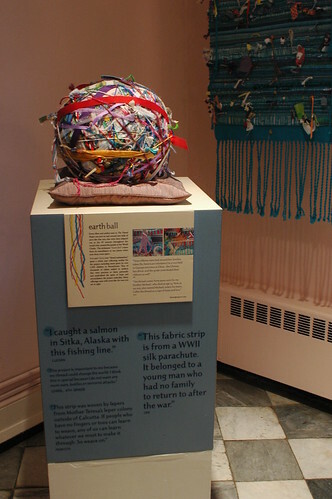 Right now it's housing the Threads Project, which collected threads, ribbons, and so on from all over the world and distributed it to weavers all over the world to create the works you see below. One of the losses at St. Paul's was a large Sycamore from the cemetery. If the tree had not been there, the church would have sustained even greater damage from debris which felled the tree instead. 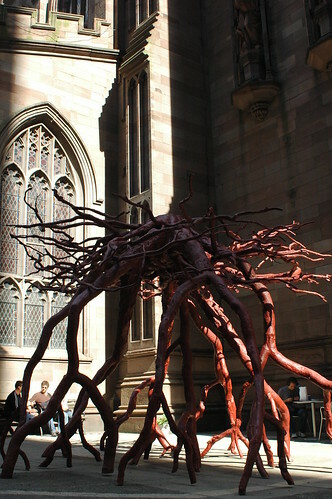 The tree has been captured as a symbol of the day, by casting its root system as a sculpture in bronze. 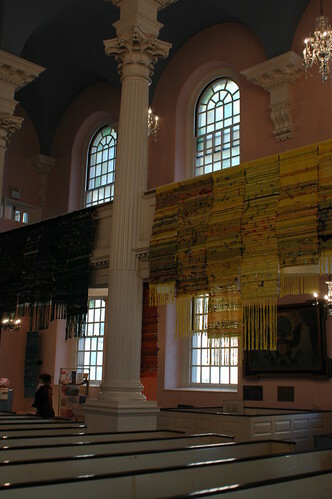 This sculpture is permanently placed in a courtyard outside Trinity Church. The sculpture is called "Trinity Root." And so we've come full circle. From Trinity, to Ground Zero, to St. Paul's, and back again. We grieve the loss of a great tree, whose death saved others' lives, and celebrate it. We grieve the garden, and grieve through the garden. It's the weekend before five years after. I will be mowing the lawn, weeding, maybe sifting some compost, and preparing the garden to receive the bulbs which should arrive in a few weeks. I will do all these ordinary things. And when I return to work on Monday, I will look up, and turn my face to the hole in the sky, and remember again. "11% scored higher (more nerdy), and 89% scored lower (less nerdy). What does this mean? High-Level Nerd. You are definitely MIT material, apply now!!!." Only 89. (Sigh!) I'm not as nerdy as I used to be. 20 years ago I'm sure I would have scored much higher. But then, I also once thought Mensa might be a way to meet people. "Thanks" to Pharyngula for bringing this to my attention and helping me waste another 10 minutes of my life. 9/11 memorial plaque at the southeast corner of the Cherry Esplanade at the Brooklyn Botanic Garden. In observation of the fifth anniversary of 9/11, the Brooklyn Botanic Garden will be open this coming Monday, September 11, 2006. The Garden is normally closed on Mondays. All admission fees will be waived. Hours are 10am to 6pm. If I didn't have to work this Monday, that's where I would be. This may be a little long. It will come round to gardening. There's a connection. I promise. 1 year ago last Tuesday: Katrina strikes Louisiana, Mississippi and Alabama. 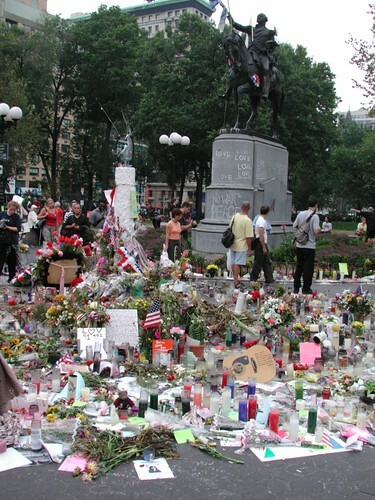 5 years ago next Monday: Terrorists strike the United States. 25 years this past June: AIDS "strikes" with the first CDC report of a cluster of pneumonia cases among gay men in Los Angeles. Each of these has been in the news recently. Each has reminded me of my own experience of these, my own shock, grief, and trauma. The ways we observe anniversaries is arbitrary. For example, I was shocked to tears for weeks by the Indian Ocean Tsunami of 2004, which killed 100 times more people than Katrina. The earthquake which precipitated it left the entire planet ringing like a bell. The observation of "25 Years of AIDS" at this year's World AIDS Congress is pinned only to the first official report of a cluster of unusual deaths by the Centers for Disease Control in June of 1981. The timelines of epidemics don't follow our categorizations of them. The night before Katrina made landfall, I was tracking its development and watching its progress through the radar loops on NOAA's National Hurricane Center. I remember in particular the clearly visible eye. I knew this was bad, as this was an indication of the strength and organization of the storm. The morning after, I learned how bad it had been. The height of the storm surge, which hit Mississippi the worst, especially surprised me. The "secondary" impact following rupture of the levees in New Orleans underscored for me a truth I've learned from Zen: Pain is inevitable. People cause suffering. Monday we drove to Mohonk Mountain House, a grand and rustic retreat in the Shawangunk Mountains outside of New Paltz. None of the rooms have televisions. Our room had a wood-burning fireplace. Our balcony looked over Mohonk Lake to the surrounding cliffs and mountains. Mostly I said "Wow" a lot. Across the lake from the lodge a peak, called Sky Top, rises several hundred feet [not quite, maybe 150 feet] above the lake. On Sky Top is a stone observation tower which looks over the lake, the lodge, and the surrounding cliffs and mountains. Tuesday morning [we] hiked to the peak and climbed to the top of the tower. On the way to the trailhead I overheard one woman saying to another something about a plane being hijacked. I didn't think anything about it at the time. [We] were joyful to be together in such a beautiful setting. We were at peace with each other, and surrounded by nature. As we climbed down the stairs inside the tower I was singing, "I love to go a-wandering ..." As we turned the third flight of stairs down, we met an old man climbing up. I joked to him "Don't mind me." He looked up at us. His eyes were welled with tears. He said to us "Did you hear what happened?" 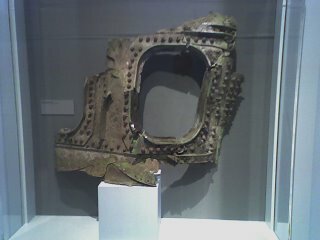 That's how [we] first learned that both towers of the World Trade Center had been struck by hijacked planes. By the time we got back to the lodge, the staff had setup several televisions in public rooms. None of these went unattended before we left on Wednesday. Most of the afternoon and evening activities at Mohonk were cancelled. The evening's scheduled film, "Deep Impact," in which the world is struck by an asteroid, destroying the eastern seaboard cities of the United States, was replaced by "City Slickers." By sundown, the flag flying over Mohonk Mountain House's highest tower was at half-mast. Sometime Tuesday morning the initial denial had broken and I was able to watch one of the large-screen videos setup in one of the rooms. I watched for the first of many times the South Tower explode and crumble. I work two blocks from where the towers were. I've seen it from the street, from the roof of my office building, from our lunch room ... I try to approach my presence in the city at this time as a naturalist, observing and recording changes in the physical environment and the behavior of its inhabitants. I want to remain present without withdrawing, so I can bear witness.The fires still burn. [They burned for months, into the winter.] Smoke still scents the surrounding streets and buildings. While rain has rinsed most of the gutters, ash still coats statues, windows and rooftops. In low and sheltered areas, the rain and ash mixed with shredded documents from the towers to create a gray papier mache. 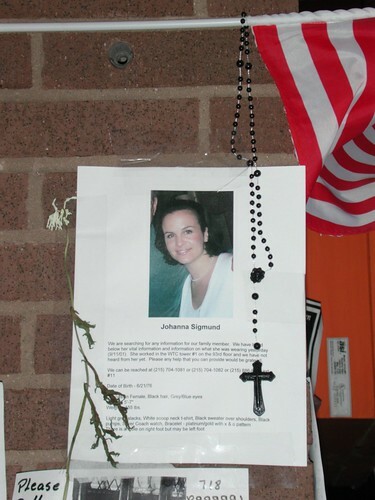 The "Missing Person" posters - and only those closest to them held any hope they would be "found" - and sidewalk memorials of candles and the poetry of anguish, rage, and hope, are slowly eroding. Preceding all these singular events of recent history is the AIDS epidemic. I moved to New York City in the winter of 1979, and shortly thereafter settled in the East Village. This was an epicenter of what was first called "gay cancer," then GRID, Gay-Related Immunodeficiency Disease, and, finally, AIDS, Acquired Immune Deficiency Syndrome. Years ago, I gave up trying to keep track of how many people I've lost to AIDS. Lovers, boyfriends, friends, neighbors, acquaintances, shopkeepers, bar buddies ... Where do you draw the line? I estimate that half of everyone I ever knew from that time of my life has died, but I will never know, and there is no way to know. A community, a way of life, was destroyed. I took solace in reading about the Black Death in Europe in the 14th Century, during which 30-50% of whole towns died. The devastation was so great and sudden that it led to the collapse of the feudal system: there simply were not enough people to work the land. That level of disruption was something I could relate to; I was living it.